Time is running out for you to make the most of your Apprenticeship Levy so make sure you use it and don’t lose it! If you haven’t spent it yet, South Devon College can help you find a way to make it benefit your business. Our Employer Engagement team are available to provide free business and training needs analysis to ensure your business is operating effectively. We pride ourselves in offering bespoke solutions that suit your needs and make a real and lasting difference to your organisation. Whether you need a short half-day course or a substantial programme of training, we have the courses to help you develop your company. The apprenticeship levy applies to current employees within your business. The College runs a range of apprenticeship programmes to upskill your staff. As a levy paying employer you can transfer up to 10% [as from April 25%] of your funds to other businesses. This can benefit the local community or generate closer collaboration within your supply chain. Are you looking to support a linked SME by transferring some of your levy funds? 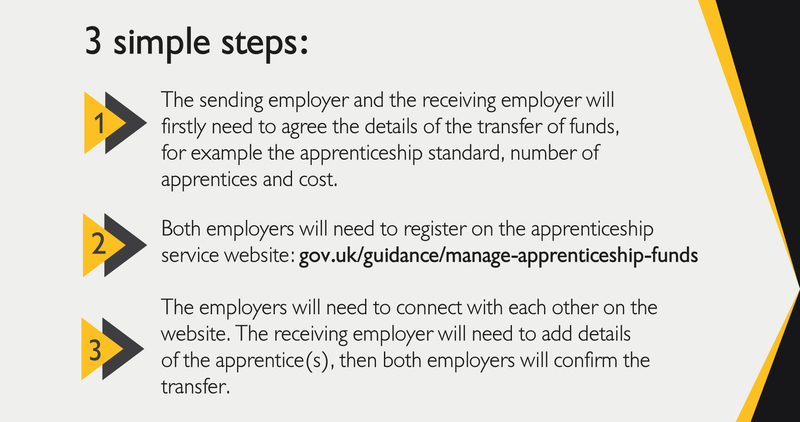 This is a great way for both employers to invest in apprenticeships to grow future talent. What happens if you don’t spend your levy? Funds will start to expire from your accounts during May 2019. Contact our Employer Engagement team on [email protected] or call 08000 380 123 and press 4.